Healthy Snack Wednesday is back! I had class on Wednesday nights this semester and that made it difficult to post a new healthy snack idea each week. I still had plenty of snacks, just no time to share them with you! Now that class is done for the semester, I’m excited to bring back Healthy Snack Wednesday (HSW)! For the return to HSW, I have a delicious new treat to share (plus a giveaway!). Take a look at past HSW entries here. Back in March I was contacted by the marketing manager at Jody Maroni’s Sausage Kingdom. She asked if I was interested in trying out their new low-sodium sausage minis. They sounded like the perfect match for HSW – 75% less sodium than their full-size counterparts and just 40 calories per serving. 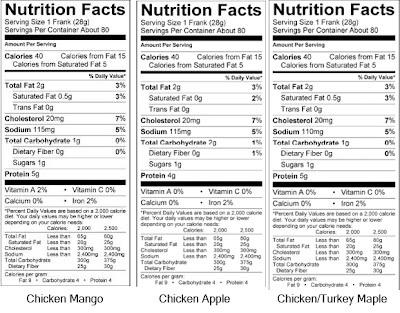 Here's a look at the nutrition information. I could definitely see that in the sausage minis that I sampled. 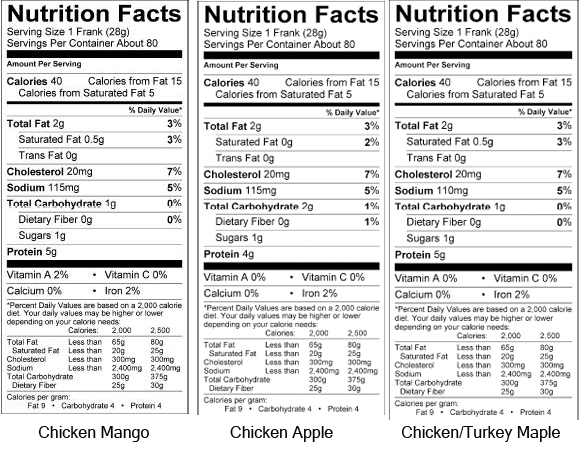 I received three flavors to try – chicken mango, chicken apple, and turkey maple. Here’s a close-up look at the chicken apple. You can see the chunks of apple and the spices. All of the sausage minis are made with a natural lamb casing. It had a good snap and kept in the the juiciness of the ingredients. Time for a confession – I don’t know how to cook sausage! We never buy it, since we don’t eat pork in the house and haven’t fallen in love with any turkey or chicken sausage from the grocery store. I turned to my favorite sources (Joy of Cooking and other books in my collection) with no luck. Why would anyone just write “put it in a hot pan and cook until done”? So I heated up my skillet to medium, added a few sausage minis and kept turning until they seemed completely cooked. I also may have used my instant-read meat thermometer to check the internal temperature of the sausage mini. Hey, I’ve never cooked it before and just wanted to be sure! We tried the turkey maple first for breakfast. I served it on the side of scrambled eggs and whole wheat cheese quesadilla. Yes, that would make for a great breakfast burrito but I love lots of components to my meal. The turkey maple was my favorite – I loved the maple flavor and I especially loved that it wasn’t terrible for me! The chicken apple was filled with juicy chunks of apple. All of the flavors were juicy and full of flavor. These are great to add extra protein to breakfast (or really any meal). This weekend I plan to turn the chicken sausages into 'pigs' in a blanket for a get together. I think they will be delicious! Thanks to Jody Maroni’s for letting me sample their new products! 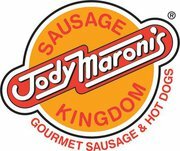 Jody Maroni’s Sausage Kingdom has generously offered to give one lucky winner a t-shirt and 5 lbs of sausages (your choice of any flavors, including the minis)! You can enter up to four times – be sure to leave a separate comment for each entry. Winner will be selected by Random.org and announced next Wednesday, May 11. All entries must be received by 8:00 p.m. on Tuesday, May 10. Winner must be in the continental U.S. The prize will be shipped directly from Jody Maroni’s Sausage Kingdom. Subscribe to Good Cook Doris by email or become a follower via the Google Friend Connect widget on the right sidebar. Full disclosure: I was contacted by Jody Maroni’s and provided with complementary samples of sausage minis. I was not compensated monetarily or obligated to review the products. All opinions are completely my own! I love a good herby chicken sausage! My method of cooking is to cook it in a covered skilled with a little bit of water until the water cooks through...and then make sure to crisp up all of the sides! 1st Entry- I really like all types of sausage and love to try new flavors. However, I tend to enjoy traditional italian sausage (spicy of course) the most! 3rd Entry- Followed and Tweeted! 4th Entry - I subscribe! My favorite sausage flavor is Italian! I'd love to try the pork bratworst. I like jody's on facebook as michele malone. YUM! Great giveaway!! I'd love to try the chicken pomegranate....sounds different! Thanks MB! Hope you are doing well! I love anything that is maple so i'd probably go pretty tame and try that maple turkey sausage! Yum! The Chicken Andouille would be a great flavor to try, but I would be interested in the Kobe Beef Hot Dog since summer is around the corner! These look great! If I win, I would like to try the Chicken Apple and the Bratwurst too... They would be perfect at my first BBQ of the summer!